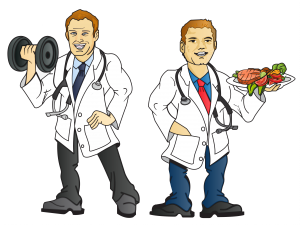 #DocsWhoLift is a concept created by Doctors Karl & Spencer Nadolsky in order to promote lifestyle as medicine and help patients fight preventable diseases such as Type 2 Diabetes and Obesity. While many doctors will push drugs to treat their patients, “docs who lift” utilize diet and exercise as primary prescriptions. Preventive medicine lifestyle promotes health and well-being and also performance and enhanced body composition to give the best of all worlds. Our goal is to teach a simple and powerful lifestyle with maximized practicality. We tends to recommend a lower carb/mediterranean/primal way of thinking but takes into account all of science, research, and experience. Read more from Dr. Karl and Dr. Spencer as well as additions to the family (Dr. Jenna Nadolsky – Pediatric Resident Physician, and Rachel Nadolsky – Nurse) by clicking on their names on bottom of this site. What makes these recommendations different from the other fad diets/lifestyle gimmicks? It is not a gimmick at all. It was created using real evidence based research as well as practice from physicians with elite athletic background viewpoints. DocsWhoLift is not a bodybuilding/muscle mag site… it is a real life practical guide for everyday people who want to be lean and healthy. People everyday ask them what their secret is to being lean and healthy. The real secret is that there is no secret. Docs who lift advocate a lifestyle that can be adopted for as long as you live. It isn’t a gimmick, it isn’t a fad, it is just what they call – Lifestyle Medicine. Learn more by following us on social media: Facebook (Dr. Karl & Dr. Spencer) and twitter/Instagram (@DrKarlNadolsky & @DrNadolsky).